Put KAYAK’s years of online experience to work for your business now. Let’s make sure your website is working for your business, not against it. If you’re looking for a partner to help you through the technical mumbo jumbo of your website and make sure nothing in your website is holding your business back, now is a perfect opportunity to connect with a member of our expert team. General help and support plus website maintenance services. See plan details below. 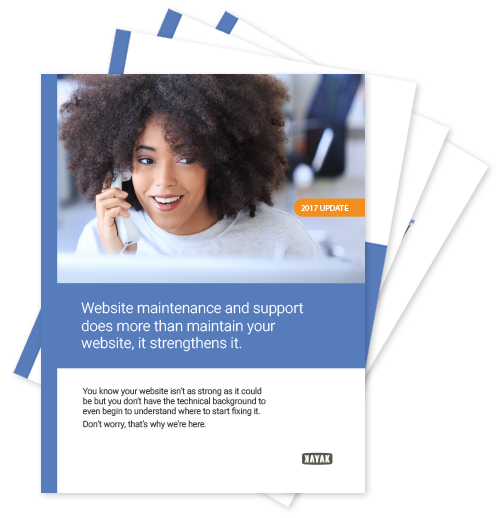 The Support Plan plus proactive SEO and lead capture activities. See plan details below. We hired Kayak Online Marketing to help us with our publishing site. [KAYAK] had recommendations during the first meeting from research done to prepare and continued to provide excellent recommendations that made a difference in our revenue. At KAYAK, we help our clients get the kind of real-world business results they're looking for. Call us today at 1-855-228-2525 (toll-free) or complete the contact form on this page to kick things off. Learn about our unique Fix, Optimize and Dig approach, and get a copy of our Brochure right now.